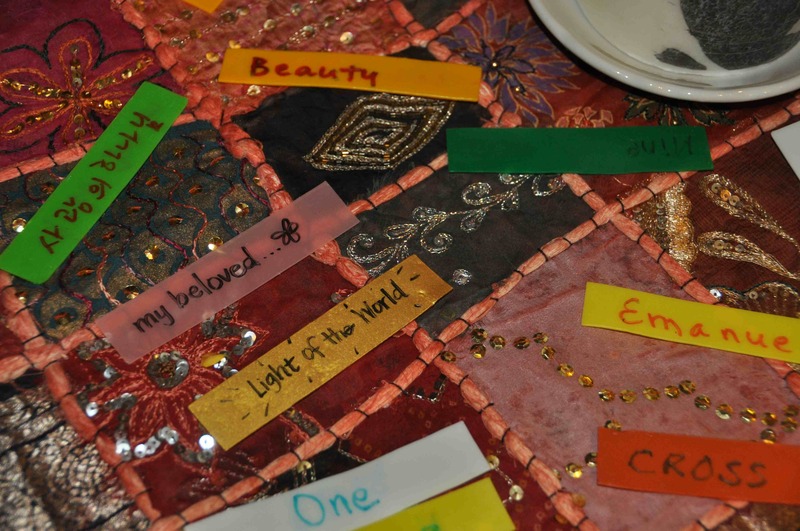 The following interactive activity can be used when exploring different names for God or stories about the meaning of names in the Bible, baptism, or names that we claim as our identity as a child of God. 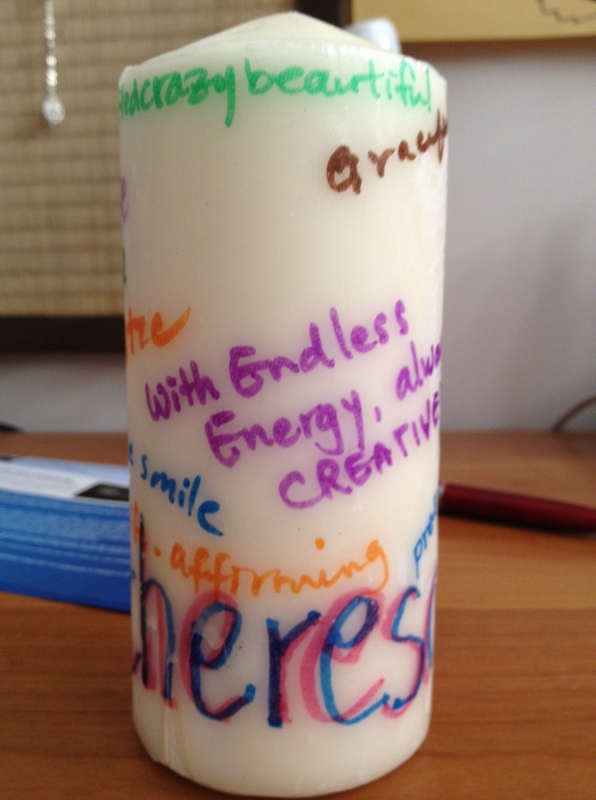 For a recent conference, I made the following candle. 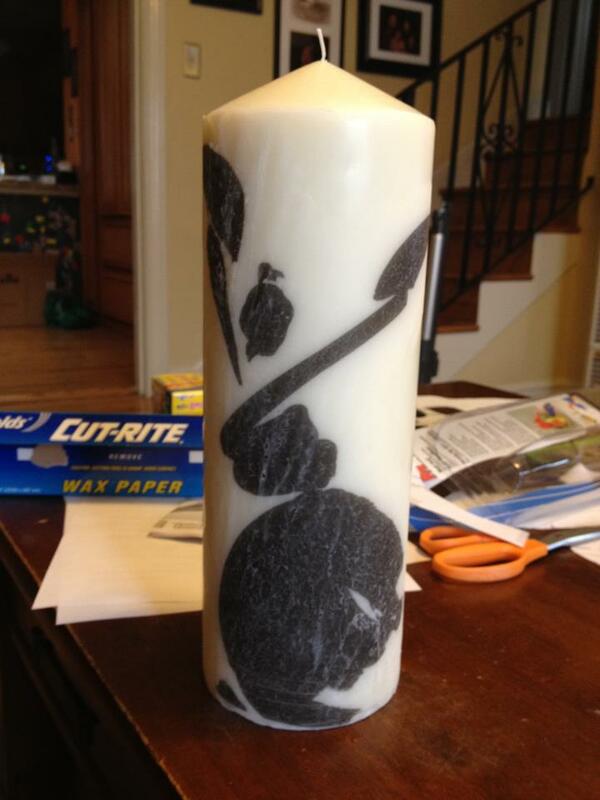 I put the logo on a 9″ tall candle using wax paper, tissue paper, and a heating tool. The process is explained here. I cut up strips of Stockmar decorating wax and had participants write a name for God and a name God calls them. After worship, I gently heated the strips of wax and added it to the Christ candle, which was to be used everyday at worship. The wax strips can be warmed with a blow dryer or by quickly running the back through the flame of the candle. At the end of the conference during closing worship, I provided smaller candles (one for each participant.) 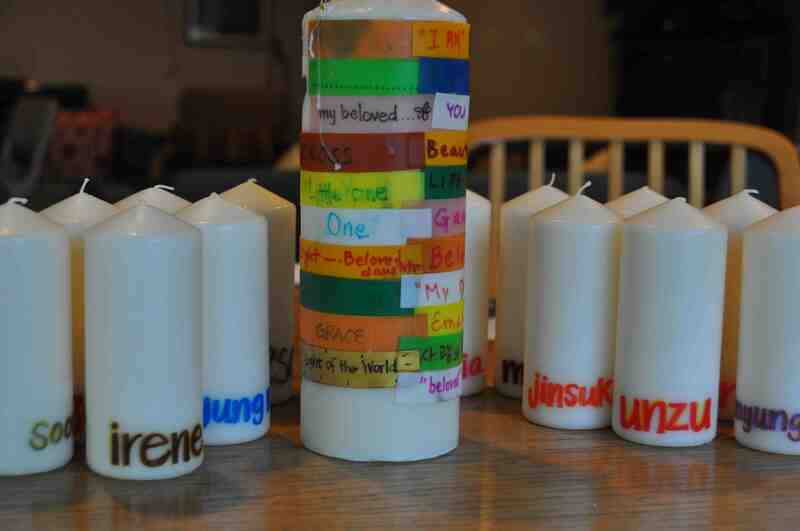 Using the same process when putting on the logo, I put the names of each participant on each candle. I set up the table so that their were pieces of tissue paper next to each candle. 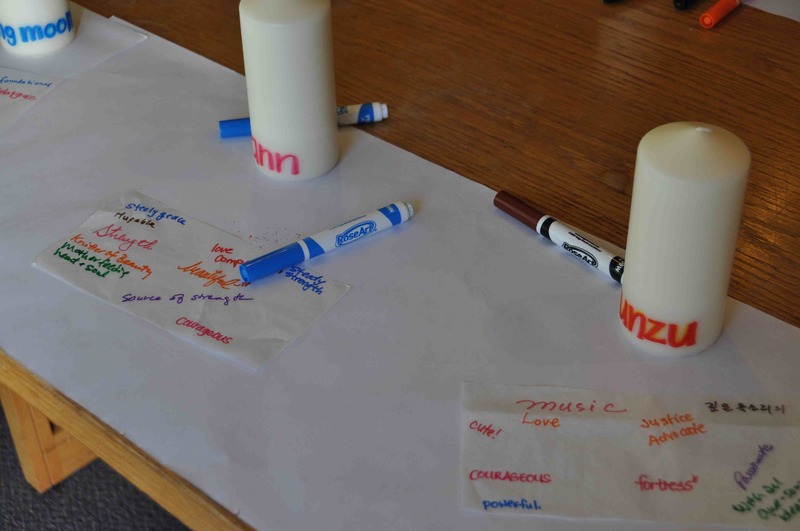 I then invited participants to write names for each person on the tissue paper. 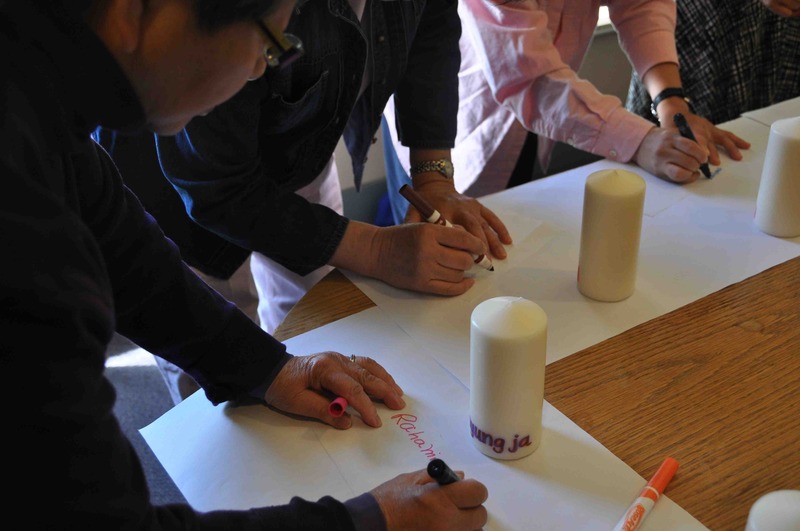 Using the same process to put on the logo, these words were put on their respective candles for each participant to take home with them, reminding them of the names that their fellow sisters call them. ← What Came First – the Mentor or the Mentee? Where did you find the Stockmar wax strips? Were you able to buy them in bulk? 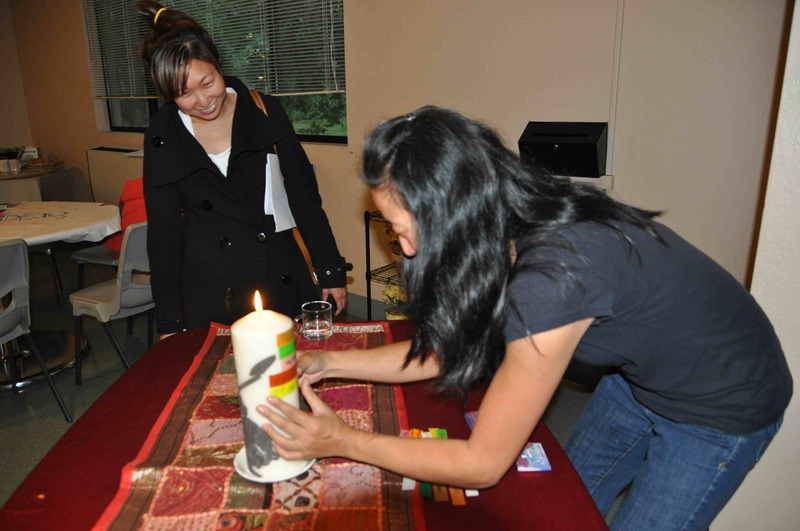 If you do the tissue paper transfer can you light the candle? The paper doesn’t catch on fire as the candle burns does it? If you google stockmar wax, you should see vendors pop up like amazon.com. As for the tissue paper, it doesn’t catch on fire. Most candles only melt in the center and not towards the outside. This is absolutely genius. 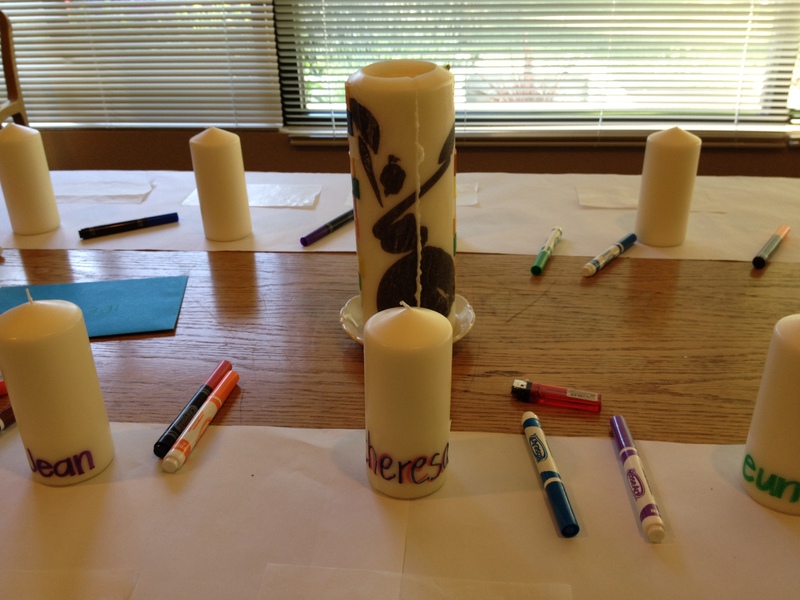 I used it as a baptism activity with kids from church for a worship & sacraments workshop. We talked about baptismal name, they wrote a name God calls them and they call God, and decorated it with symbols. And it was a great tool for explaining the concept of baptism engrafting us into Christ, just as the tissue paper is engrafted into the candle. Thanks for the idea! Thanks for sharing Jane. I love hearing the different ways people use these ideas.